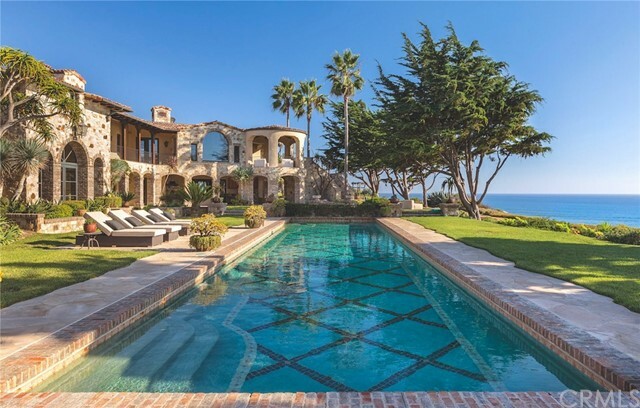 One of the most impressive oceanfront estates on the Southern California coast, this nearly three acre gated seaside compound sits on a scenic beach and renown surfing spot. Located in guard-gated Cotton Point Estates, this residence contains a multitude of spacious rooms within its nearly 13,000 square feet of living area. The expansive parcel with 450 of ocean frontage affords an eminently livable arrangement of these spaces that captures amazing garden, ocean and sunset views from every major room. Grand two story spaces with beamed ceilings and intricate brick + stone walls are situated to take in ocean views through bronze framed windows. Limestone floors, walnut millwork, and Venetian plaster complement the architecture and setting. The rustic motif creates a casual elegance perfect for living and entertaining in this seaside setting. Highlights include an enormous master suite with sitting room + private terrace, 3 bedroom guest house, sport court, 55 oceanfront pool, event lawn, and a 9 car garage. The residence is surrounded by generous terraces, broad lawns and mature gardens set above the ocean. Designed without compromise, this offering includes every imaginable amenity in a setting that is private, spacious, and surrounded by ocean views.